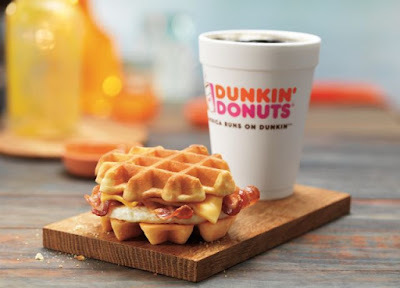 Dunkin' Donuts releases the new Belgian Waffle Breakfast Sandwich into their breakfast rotation, featuring two thick Belgian waffles in lieu of the more standard breakfast breads (i.e. English muffins, toast, and croissants). The new, limited-time sandwich arrives nationwide on Monday, August 29 and consists of cherrywood-smoked bacon, egg, and American cheese between two Belgian waffles. The waffles are meant to be fluffy and light on the inside and crispy on the outside. The new waffle sandwich, which is available all day, is billed as an "on-the-go" option for a sit-down dish. This isn't the first time that Dunkin' Donuts has released a waffle sandwich. They had a blueberry waffle version back in 2011 and have tried other versions as well. Other chains that have offered a waffle sandwich include Jack in the Box and White Castle (where it's still on the menu). The suggested price for Dunkin's Belgian Waffle Breakfast Sandwich is $3.89 (may vary).